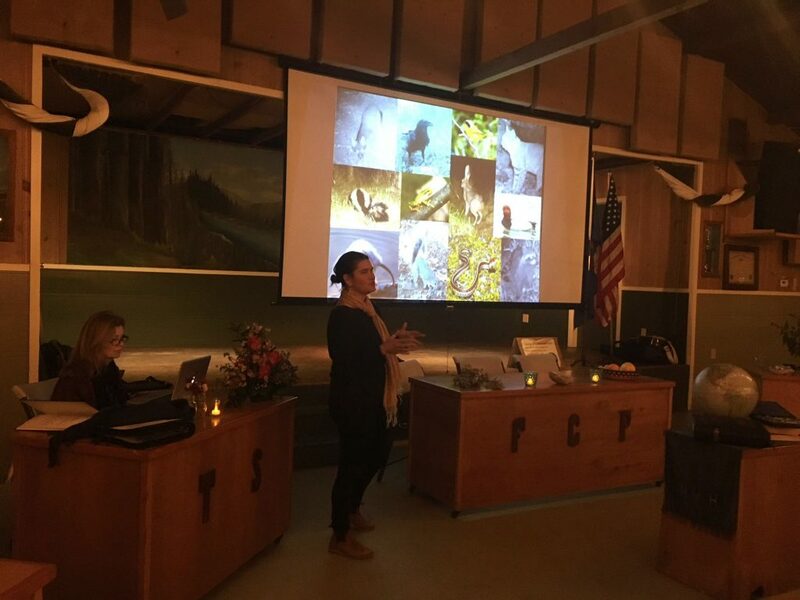 Meghan Walla-Murphy, an ecological and conservation educator, researcher, author and storyteller, gave a fascinating presentation at our January potluck meeting. Meghan has traveled the world living with peoples whose lives are naturally integrated with the environment. • Meghan is a wildlife tracker who has worked with ranchers and vintners, as well as many conservation groups and native peoples. • Meghan’s work describes the intersection between humans and the wild. Wild is here with us all of the time, and she reminds us that we all are descended from trackers. • What is tracking? —following footprints—but also the lens through which to see life as we can track emotions, relations, trends and changes. • All tracking comes from a knowledge home, ecology, and place. • Pattern literacy is where science and creativity meet to inform us about ecology and its inherent beauty and complexity. • The story of geology, water, plants, and animals is all related. • Mountains are tracks of plate tectonics, and the San Andreas Fault has informed the geology of where we are. • Patterns of weather are in turn influenced by geology. • Topography and weather make our area one of the 7 hotspots of biodiversity on the planet. • Biological diversity equals cultural diversity. • When you lose the relationship between land and water, you lose the language and culture of the people who lived there. • California was highly managed by native people through harvesting and tending the land for food and diversity. • There is a huge contrast between the culture of resource extraction and then later the conservation ideology of no intervention with land and plants—hence the build up of trees that have become fuel for the recent fires. We need to be intentional in our interventions. • Early societies that combined agriculture and hunting/gathering together had a rich diet of high protein and promoted the local biodiversity. • California has highest number of endangered species partly because we have many species endemic to California. • Landscapes are getting fragmented which puts stress on the plants and animals in the populations. • Sonoma Co. is 85% privately owned. • Michael Soule has done work on “islands of habitat” which can lead to a loss of biodiversity. • Breaks in the pattern gives us new information and the story becomes rich. • Tracking gives us a sense of place—where you live and knowing where you live. • Salmon returning to natal tributaries and are able to travel up to 7,000 miles and return years later. • Each animal has a story to tell—become in relationship with any species, create habitat wherever you are. • Beavers are starting to return. If you see any beaver anywhere, be sure to notify a wildlife organization. • Beavers created dams that helped replenish the ground water. • Bears are in Sonoma County. Coastal California had the most grizzlies anywhere and now they don’t exist in California. • Both bears and salmons are keystone species—the loss of either would cause disproportionate damage. • Anadromous Nutrient Cycle–anadromous means the ability to live in salt and breed in fresh water. • Bears eat salmon, and when they are plentiful, they eat only the heads and then spread the fish bodies in the forest. Other animals come and then the breakdown goes into the nutrition of the trees. • Scientists have found marine isotopes in the core samples of trees because of this interrelationship. • Humans and bears deeply intertwined in stories and shape shifting—humans have watched the bears to learn about what plants to eat for medicines as another example of the deep connections between people and nature. Books Meghan recommended for further exploration of these topics. ‹ Sonoma County Seed Swap 2019 happens Tuesday Feb. 12!